I’ve done a bit of detective work since I put this query up. Most of my pics are 16:9 or 9:16, depending on orientation. Pictures posted since the beginning of April seem to be too big for this page (they are going up at a bigger size than they did before) and then, if they are horizontal 16:9 pictures, they get stretched vertically or, more properly, squeezed horizontally. I’ve worked (see first fix) out that if I use smaller picture dimensions, this won’t occur, but I’m loath to have to do that too generally and mystified what has introduced the problem. Is it a problem with the “theme” of the page design? Very lazy of me to ask the world at large about this, and it will be even more embarrassing if no-one answers. So I’m saying right now that when I delete this post it doesn’t necessarily mean that nobody did, even if I still haven’t fixed the problem. First fix: [actually second edition of first fix now] looking back over older posts, I see that previously they were sized a bit smaller. I’ve reduced them all to 448:252. Earlier pictures, which fit, adopted (I can’t work out exactly how) 450:253 as their dimensions. I’ve done the same with Dulwich Hill Light Rail Community Forum, but not yet Good Friday, driving southwards. I did think of heading this post “Happy Bikeday.” It is just coming up to two years since I purchased my present bike (1) (2). It continues to give me pleasure. If I just counted train fares saved, it probably hasn’t quite paid for itself, but if I include the times when I would probably have taken a taxi home late in the evening or early in the morning, it almost certainly has. 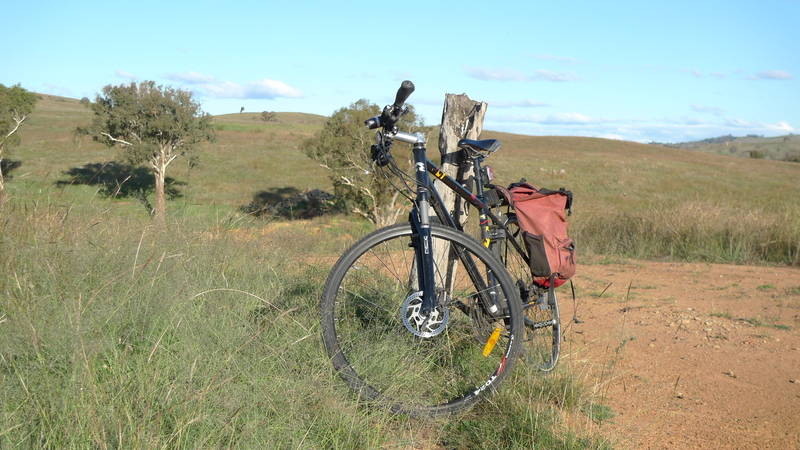 The major expenses incurred have been a thicker rear tyre and, a couple of months ago, a new and sturdier back wheel after the original broke two spokes in quick succession. The latter was probably an unnecessary expense as, after the second breakage and while I waited almost 2 months for the new wheel to arrive, no more spokes gave way. Perhaps I just needed to ride with greater care and less curb-hopping. 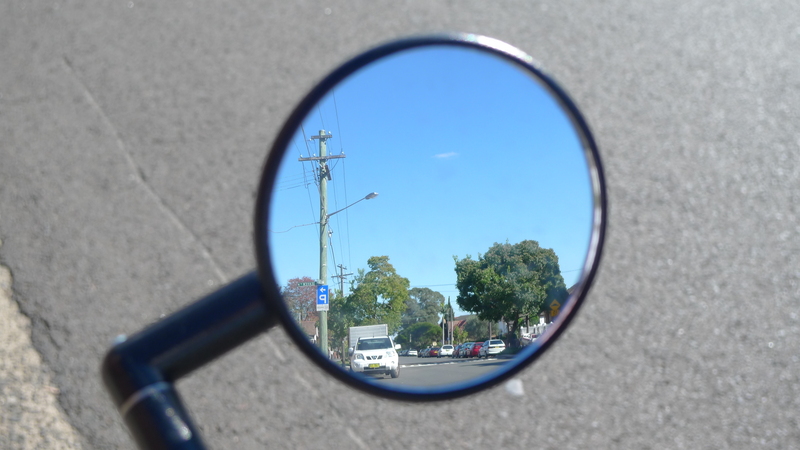 When I picked up the bike with its new wheel, I splashed out and bought a rear vision mirror, pictured above (not very realistically, and by necessity on a very quiet street). 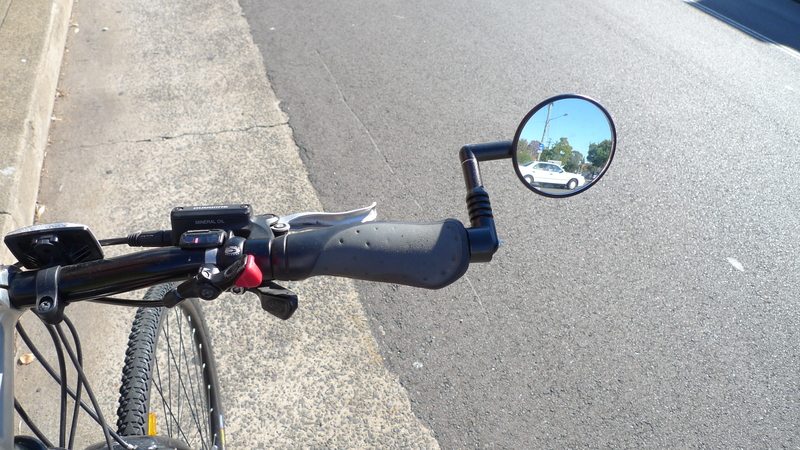 About 20 years ago I bought a similar mirror for a different design of handlebar, but somehow I never managed to get around to installing it. Finally, after over 30 years of fairly regular cycling, I have done the deed. How could I have ever ridden without one? It’s not as if I would be happy driving a car without a rear vision mirror. The parameters are different – you can look around on a bike in a way that you can’t in a car, and you don’t change lanes so often, but I am certainly finding that to know what is coming up behind me is a great contributor to peace of mind when I consider the prospect of moving further out into the traffic to avoid a hazard on the road service or the risk of doors opening from parked cars. If I’m riding up a hill in a bus lane, I know whether I can relax at the top or need to push on to let a bus get to a bus stop just ahead. On the rare occasions when I have to move across lanes, life is now much easier. In this first flush of enchantment, I have found I spend more time looking behind me and less time looking in front and around. That’s a loss in some ways, and there must be a metaphor for life in that. On the other hand, when you are on a bike what comes up from behind almost always ends up overtaking you, so hindsight is, oddly enough, a forewarinng of the future. That is often helpful, and reduces the discomforting surprise when somebody passes unpleasantly close or fast. The main downsides are an increase in my side clearance when weaving through confined spaces and some ungainliness if the right side of the bike needs to be leant up against anything. I guess someone might pinch the mirror. This is a general argument against any improvements to a bike, over and above the general risk of bike theft, but at $25, the loss would be annoying rather than devastating. And just for the record (taken near Canberra over Easter), to my [did I say I love it?] bike, Happy Bikeday! You are currently browsing the Stumbling on melons blog archives for May, 2010.